Coconut Contracting tries, whenever possible, to follow the Arizona Municipal Water Users Association (AMWUA) landscape watering guidelines. The schedule provided is NOT a definitive plan for every yard. Many factors influence how one property uses water relative to another. It’s a process of fine-tuning and subtle adjustments, depending on the time of year. As you make changes, if you begin to notice standing water, you should decrease the amount of time sprinklers are on. Conversely, if the changes lead to a dry lawn, change the schedule to increase the time. New shrubs: 3 cycles per day, 5-8 min. per cycle. Established shrubs: 1 cycle per day, 10-14 min. per cycle. New trees: 3 cycles per day, 12-15 min. per cycle. Established trees: 1 cycle per week, 45-60 min. per cycle. New shrubs: 3 cycles per day, 12-15 min. per cycle. Established shrubs: 2 cycles per day, 10-14 min. per cycle. New trees: 3 cycles per day, 15-18 min. per cycle. Established trees: 2 cycles per week, 40-45 min. per cycle. New shrubs: 3 cycles per day, 18-22 min. per cycle. Established shrubs: 2 cycles per day, 18-25 min. per cycle. Established trees: 2 cycles per week, 60-75 min. per cycle. New shrubs: 3 cycles per day, 10-14 min. per cycle. *Note – Watering schedules are not definite. Variables such as sun exposure and soil composition can cause watering schedules to vary. Whenever you alter the irrigation schedule of your plants, be attentive. Make sure that the plants are responding to the changes that you made. 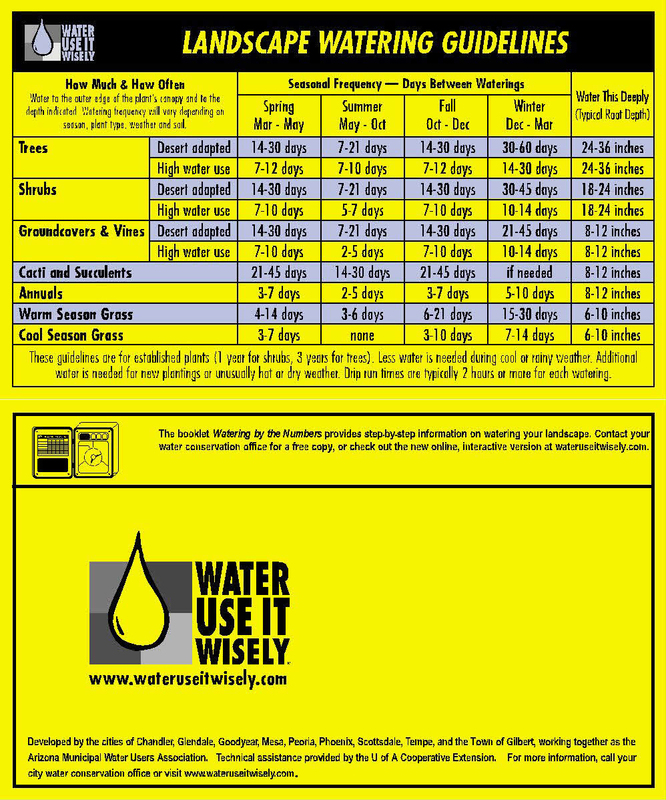 Click here to download our watering schedule card. No Replies to "Timer and Watering Schedules"